Influenza first appeared in Kentucky in Bowling Green, about September 27, 1918. Troops traveling from Texas on the Louisville and Nashville railroad stopped there and explored the city. They infected several local residents before returning to the train and traveling on. Louisville was the next city hit by the flu. It was calculated that there were approximately 1,000 cases there in the last few days of September. In the second and third weeks the deaths in Louisville were about 180 per week, and continued throughout the fall and winter months. On October 6th the Kentucky state board issued a state-wide proclamation closing all places of amusement, schools, churches and other places of assembly. At the Kentucky Historical Society I took the microfilm roll of death certificates for 1918 and randomly copied about 15 to study for cause of death. Pneumonia and influenza were the major causes. Elmer Stogsdill, Pulaski County, male, white, single, died October 23, 1918, from pneumonia preceded by influenza, duration of illness, 7 days. Born June 20, 1900, aged 18 years, 4 months and 3 days, farmer. 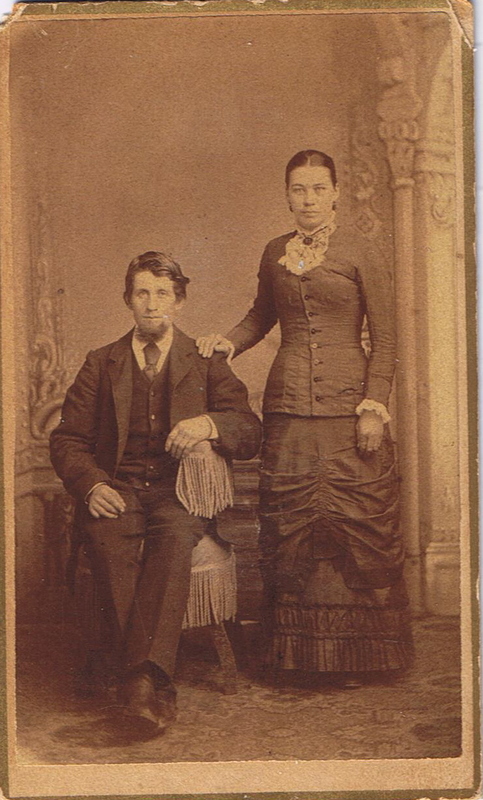 Parents, William Stogsdill and Lucy Sears. Burial Bullock Cemetery. Lucy J. Stogsdill, Pulaski County, female, white, married, died October 16, 1918, from pneumonia preceded by influenza. Born October 22, 1878, aged 40 years and 4 days, farmer. Parents, John W. Sears and Martha Phelps. Burial Bullock Cemetery. Evidently Elmer Stogsdill’s mother. Alfred Kitgore, Pike County, male, white, married, died October 26, 1918, from influenza, pneumonia, duration of illness 6 days. Born March, 1898, in Virginia, aged 20 years, miner. Parents Robert Kilgore and Nellie Mays. 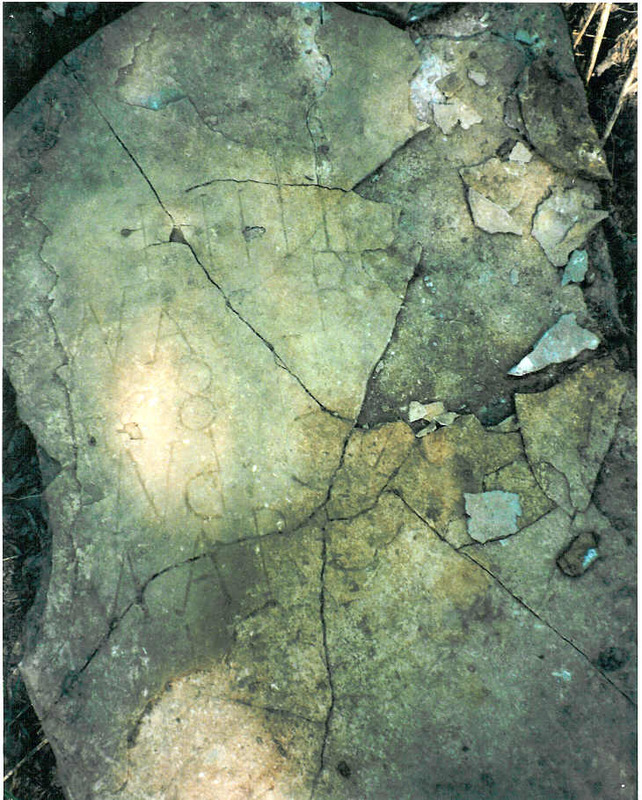 Burial Belcher, Kentucky. Clarence L. Shuck, Shelby County, male, white, married, died November 8, 1918, from pneumonia, influenza, duration of illness 10 days. Born August 16, 1893, aged 25 years, 2 months, 19 days, farmer. Parents, G. W. Shuck and Nancy K. Aldrage. Burial, Grove Hill. Ora B. Stewart, Warren County, female, white, married, died October 15, 1918, from pneumonia, influenza and labor. Born December 27, 1883, aged 34 years, 9 months and 18 days, house keeper. Parents, Taylor Burton and Susan Fuqua. Burial, Parksville Cemetery. Did her baby die, too? Monica Ford, Warren County, female, white, married, died October 11, 1918, from pneumonia, influenza, duration of illness 10 days. Born January 30, 1900, aged 18 years, 8 months and 12 days, house keeper. Parents, Sam Hurd and Fannie Miles. Burial, Barren River Chapel. Gertrude Peak, Jefferson County, female, white, married, died December 2, 1918, from pneumonia, influenza. Born September 20, 1884, in Tennessee, aged 34 years, 2 months and 12 days, housewife. Parents, Thomas ? and Margaret Kinsey. Burial, St. Louis Cemetery. Ida Alma Hubbach, Jefferson County, female, white, single, died December 8, 1918, from influenza, pneumonia. Born March 12, 1892, aged 26 years, 8 months and 6 days. Parents William Otto and Anna Schmidt, both born in Germany. Burial, St. Michael’s Cemetery. Johnnie M. Carmack, Jefferson County, female, white, married, died December 11, 1918, from pneumonia following influenza, duration of illness 3 days. Born August 22, 1888, aged 30 years, 3 months and 19 days, house keeper. Parents John C. Mimmo and Donie S. Smith. 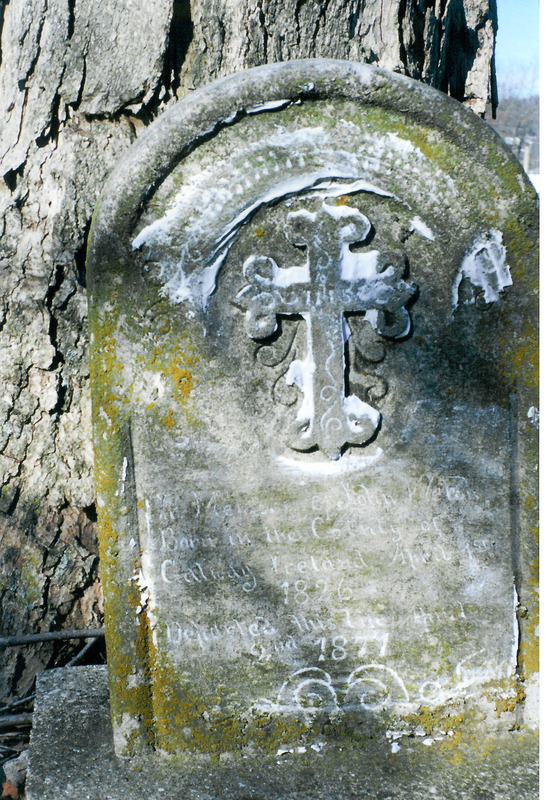 Burial, Trenton, Kentucky. Miss Pearl Bridges, Jefferson County, female, white, single, died December 13, 1918, from pneumonia and influenza. 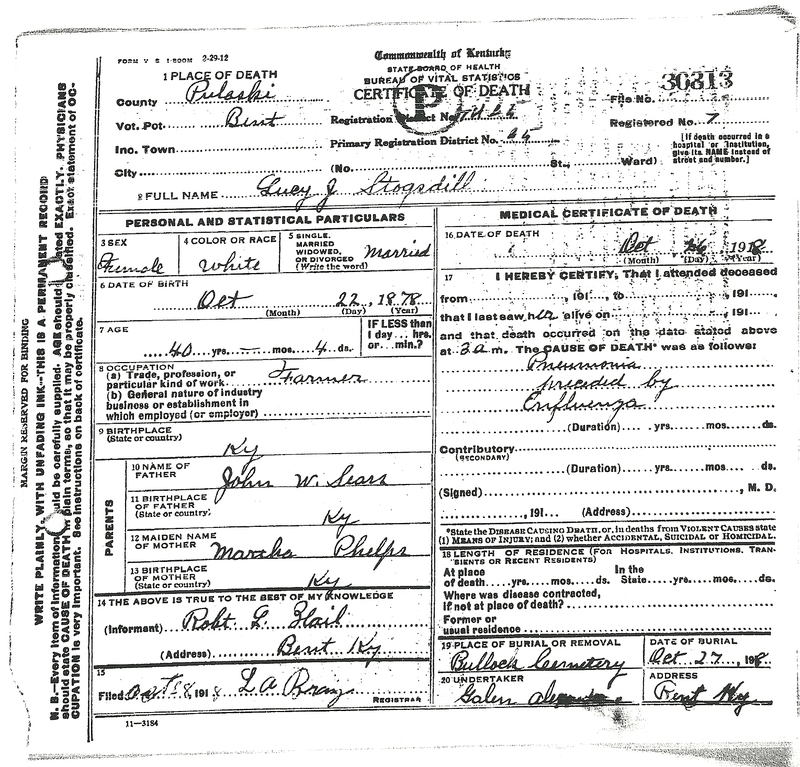 Born September 13, 1899, in Tennessee, aged 19 years, 3 months, at home. Parents Robert L. Bridges and Bettie Hickman. Burial, Cave Hill Cemetery. George Emmett Durr, Jefferson County, male, white, married, died December 24, 1918, from influenza and pneumonia. Born August 22, 1884, aged 34 years, 4 months and 2 days, engineer. Parents, Thomas Durr and Susan Hackett. 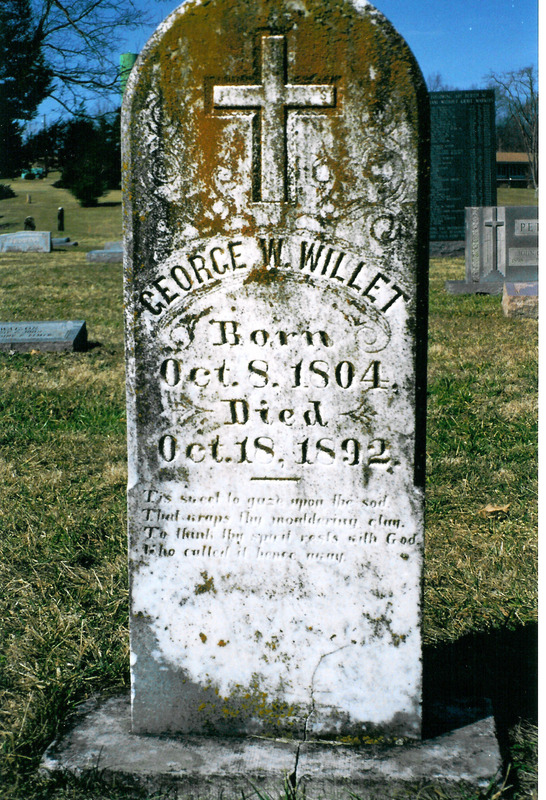 Burial, Middletown, Kentucky. Hubert Ramey, Magoffin County, male, white, single, died October 22, 1918, from pneumonia and Spanish influenza, duration of illness 8 days. Born March 20, 1911, aged 7 years, 7 months and 2 days, at school. Parents, Eli Ramey and Marietta Montgomery. Burial, Resner Graveyard. Samuel Jones, Magoffin County, male, white, single, died October 30, 1918, from influenza. Born December 28, 1895, aged 23 years, farmer. Parents Floyd Jones and Sarah Bailey. Burial, Gardner Bailey Graveyard. Eliza Williams, Magoffin County, female, white, married, died October 30, 1918, from influenza. Born October 23, 1872,, aged 46 years, 7 days, house keeper. Parents W. A. Montgomery and Rebecca Howard. Burial, ? Otto J. Peterson, no county, male, white, single, died December 13, 1918, from pneumonia, influenza, duration of illness 13 days. Born June 14, 1897, in South Dakota, aged 21 years, soldier. 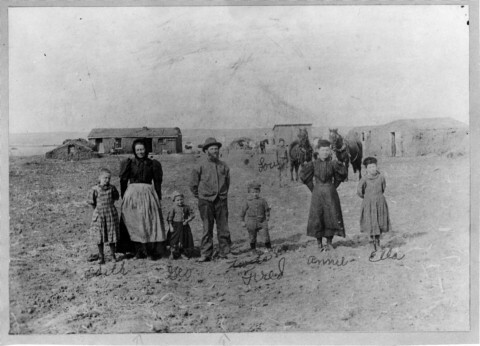 Mother, Mrs. Haus Peterson, Hettinger, South Dakota. 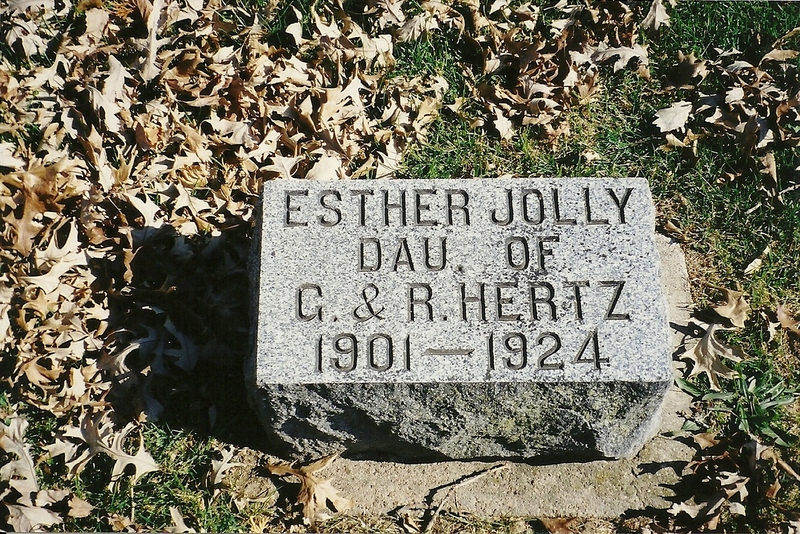 Burial in South Dakota. Mattie Hurt, Muhlenberg County, female, colored, single, died October 28, 1918, from influenza, pneumonia, duration of illness 6 days. Born January 19, 1901, aged 17 years, 9 months, school girl. Parents, Fount Hurt and Zela Wells. Burial West End Graveyard. Virgil Mason Hendricks, Muhlenberg County, male, white, married, died October 20, 1918, from pneumonia following influenza, duration of illness 6 days. Born July 2, 1883, aged 35 years, 2 months and 18 days, coal miner. 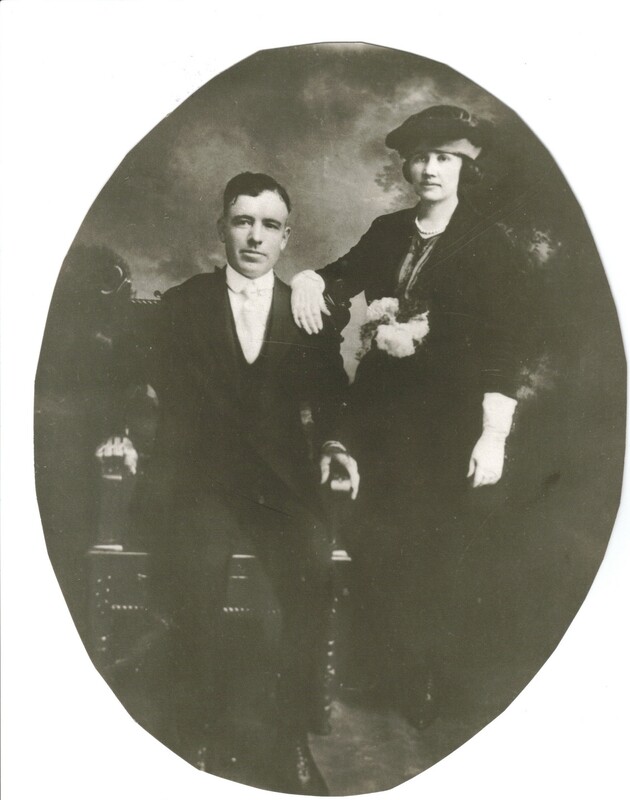 Parents, James William Hendricks, Nannie Madot. Burial Mulus Graveyard. Pearly Hill, Owen County, female, white, married, died October 16, 1918, influenza complicated with pneumonia, duration of illness 6 days. Born January 10, 1890, aged 27 years, 9 months and 6 days, house keeper. Parents, Wesley Jackson and Minnie Cammack. Burial, ? Roland Sale, aged 41, died at her home in La Center, Saturday night, December 21, 1918, of heart trouble. Mrs. Sale had been quite ill for two weeks or more of influenza, but had about recovered, and was feeling able to be up when she died suddenly. 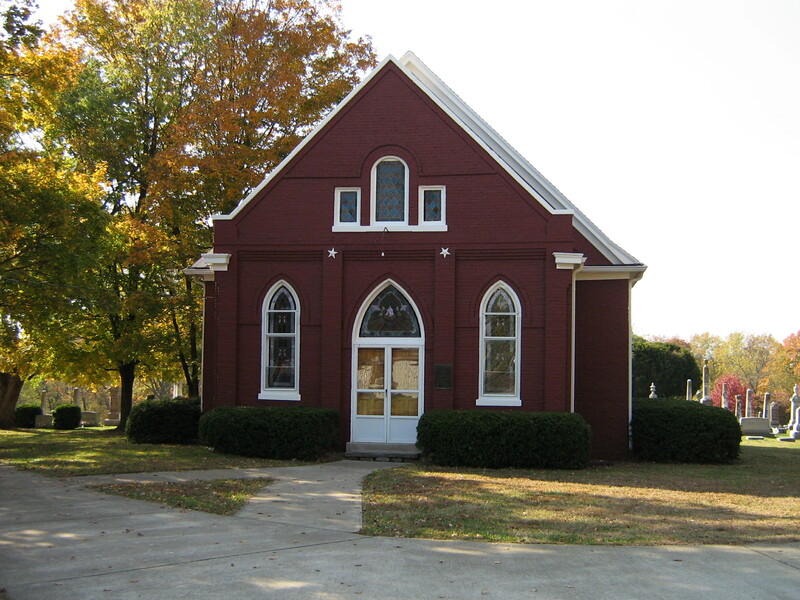 Funeral services were held at the Methodist church Sunday afternoon at 1 o’clock by R. H. Pigue, after which her remains were buried in the Sale graveyard, two miles southwest of La Center. Mrs. Elizabeth Gary, daughter of Mr. and Mrs. J. C. Gary, was born October 8, 1877. She was married to Roland T. Sale February 2, 1896, and to this union were born four children, Aubrey, Anna, Warren and Wilton. She is survived by her husband and four children, her aged father and mother, one sister and four brothers. She was a member of the Christian Church at Kevil and had lived a consistent Christian life. The bereaved family has the sympathy of the entire community. 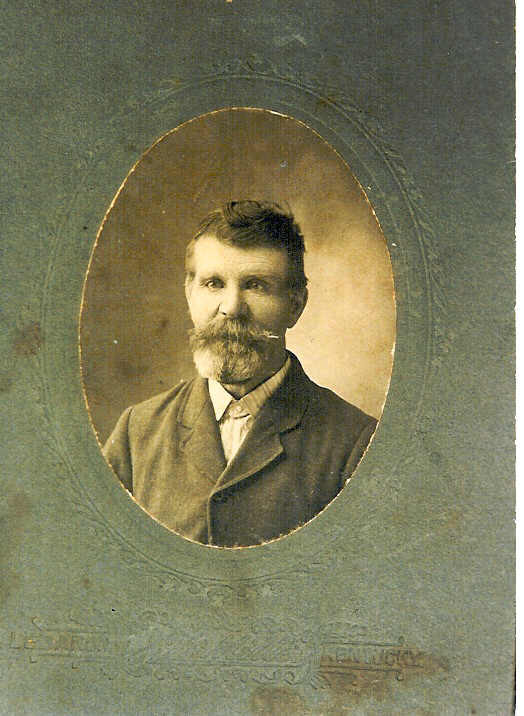 James Madison Talley was born in Ballard County April 7, 1841, died January 22, 1919, aged 77 years, 9 months, 15 days. Mr. Talley had been ill of influenza and pneumonia from which he died after an illness of one week. He was a consistent member of the Baptist church for 15 years. 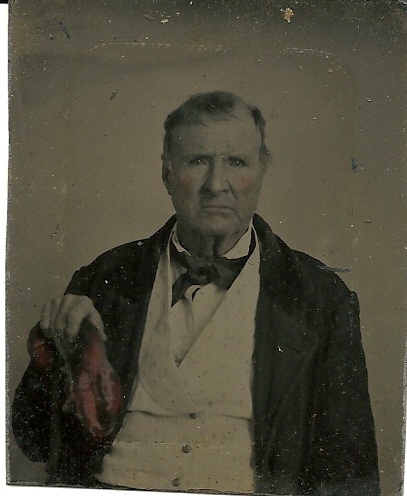 He was a Civil War veteran and had many friends in this county. He leaves a wife, Malinda Talley, three children, Mary Yarbrough, Walter and George Talley, eleven grandchildren and five great-grandchildren. 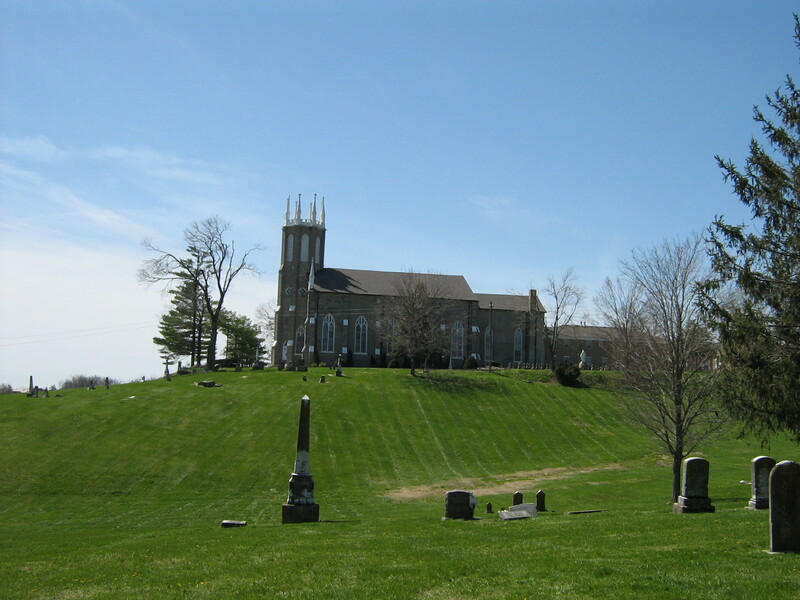 A Triple Burying – In Cumberland last Sunday three person were interred at the same graveyard, all of whom were victims of influenza. Pneumonia, however, brought on their deaths. John D. Smith, a married man and a son of Floyd Smith, had been ill for more than ten days and passed away Saturday. 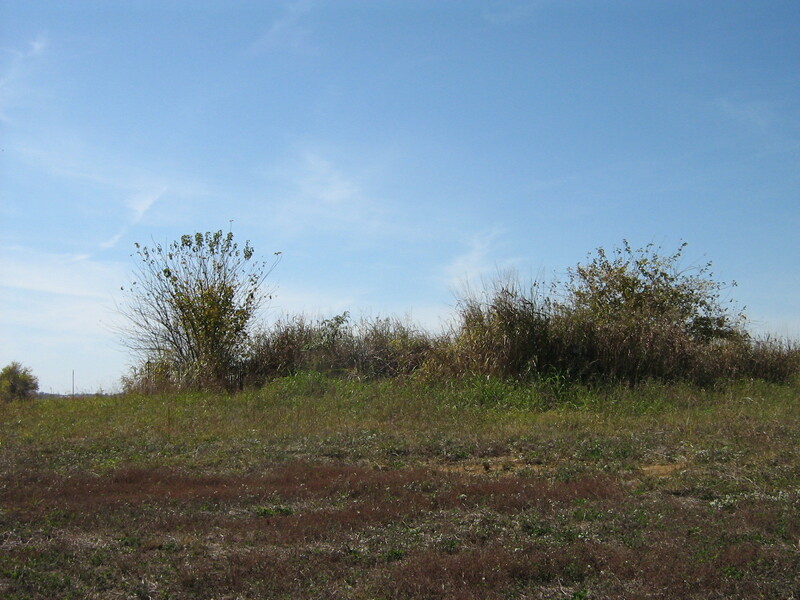 One of the other victims was a daughter of Wilse Sturgill (Hanely) and was about sixteen, the other was a daughter of David Boggs and was also a young woman. We offer sympathies to these good people in their awful distress. Quite a number of other cases of influenza are reported in that section of the county. C. M. Payne nee Miss Bertha Moore, formerly a resident of this place died of pneumonia in Louisville, November 13, 1918, where she had gone to see her brother who is ill of pneumonia at the Base Hospital at Camp Taylor. She was born August 4, 1886 at Repton, Kentucky. At about sixteen years of age she joined the Baptist church there where she held her membership at the time of her death. On June 7, 1914, she was married to C. M. Payne, and until about a year ago they were residents of this place. To know Mrs. Payne was to love her. Her sweet Christian life was an inspiration to all and her kind words have comforted many in time of sorrow. She was a devoted wife and to her only child, Anna Rae, an ideal mother, ever patient and kind. Whether at home or in the church she was always ready to do God’s bidding. Though her many friends and loved ones will miss her they are assured that He who rewards the giver of even a cup of water, will reward her for her life of service. Her remains were laid to rest at the family burying ground at Repton. She leaves a father, mother, brother, sister, husband, child and a host of friends to mourn her loss. Connie foster, wife of Mr. Byren Foster, died at her home at Covington Saturday morning of pneumonia super-induced by an attack of Spanish Influenza. 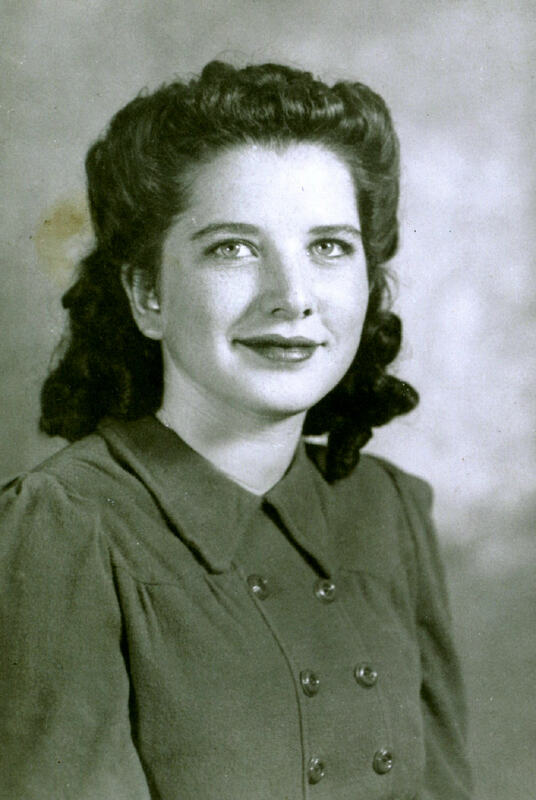 Mrs. Foster was formerly Miss Connie King, of Covington, before her marriage to Mr. Foster two years ago. 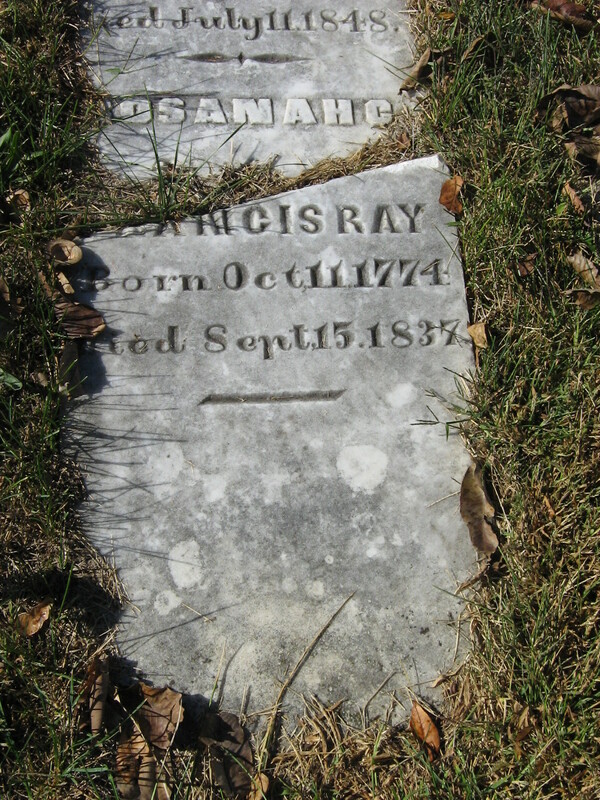 Her husband is a son of Mr. Isaac Foster, of Hartford. He was at Atlanta, Georgia, when notified of her illness but reached Covington before her death. She was buried at Covington yesterday evening at two o’clock. Mrs. Isaac Foster attended the funeral. The death angel visited this county Sunday morning and took from those she loved and loved her, Mrs. Laura Dean Faulkner. Mrs. Faulkner had been a sufferer from Spanish Influenza and pneumonia developed which caused her death. Deceased was about thirty-four years of age. Besides her husband, Dr. Morton Faulkner, she is survived by five children, four of whom are confined to their rooms with Spanish Influenza. Mrs. Faulkner was a woman of lovely Christian character, being a member of the Christian church, and always took an interest in religious work. She gave much of her time to Red Cross work and other war work in her community and will be sadly missed by a host of friends. Funeral services were conducted this afternoon at three o’clock by Rev. 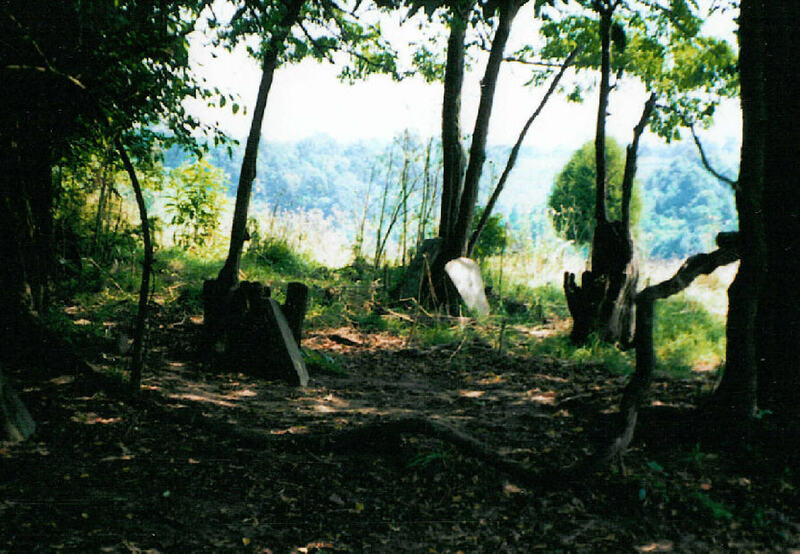 Clyde Darsie, with burial in Machpelah Cemetery. We extend our sympathy to the grief-stricken family in their hour of sorrow. W. S. Smathers this morning received a telegram stating that his brother, Mr. J. Martin Smathers had died at his home in Brownwood, Texas, on Friday, October 11th, of pneumonia. No further particulars of his death were given. 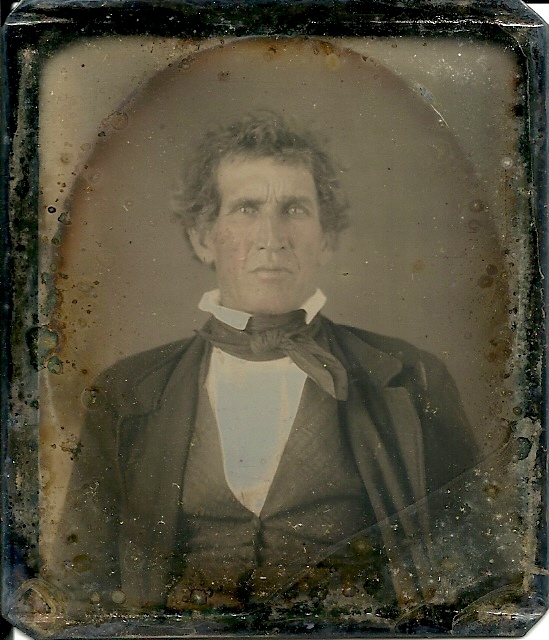 Mr. Smathers had made his home in Texas for a long number of years, and prior to going to the state resided in Bath County. 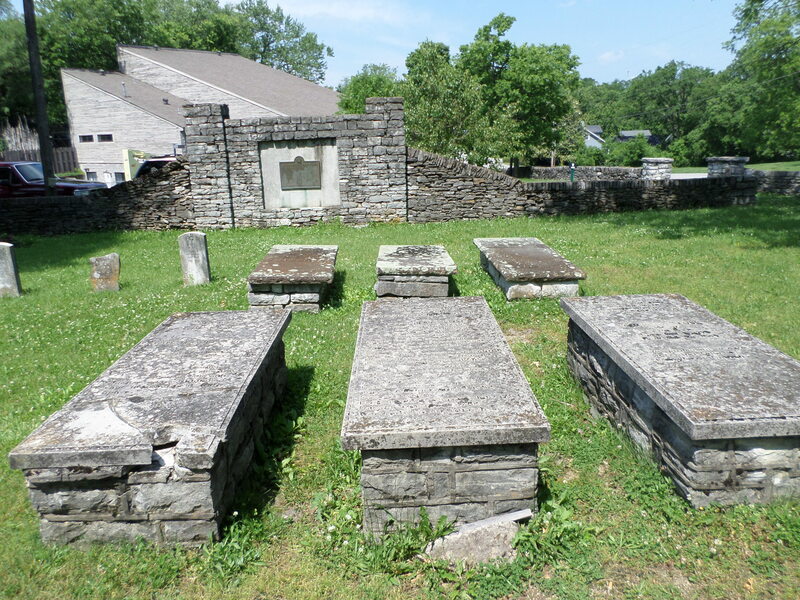 He was the oldest brother of Mr. W. S. Smathers, of this city, and Mr. A. G. Smathers, of Bath County. He was a big-hearted, upright, conscientious man and had a host of friends in this and Bath County who will be grieved to learn of his death. 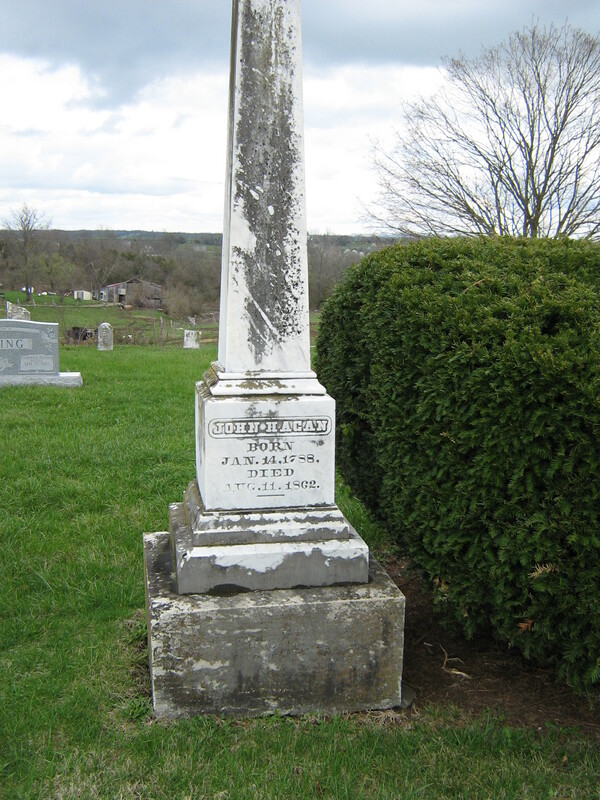 Carl King, son of Mr. George W. King, and a merchant at Crab Orchard, died there last night of influenza. He is survived by his wife, who was Miss Beulah Wallin, daughter of W. D. Wallin, also of the East End. Mr. King was about 35 years old and was a very popular, clever young man. He had lots of friends in his home town who deeply regret his demise. Much sympathy is felt for his wife and parents in their great loss. Nothing has been needed worse than lights during the influenza epidemic and no industry has had the difficulty in trying to keep going that the Mt. Vernon Power Company has had. Mr. Perciful, his son Willie, and Alfred Bryant, the three who operate the plant have all been down. Homer Proctor came to our rescue for one night, when he was taken sick. Had it not been for S. T. Proctor, who dropped his own work and took charge, the town would have been in darkness for more than a week. Not only the Power Company, but the people of the town owe Mr. Proctor a vote of thanks and a debt of gratitude for his sacrifice. Mr. Bryant is now able to be back on the job for half time, and in two or three nights, the regular all-night service will be resumed. Deaths since October 16th: Mrs. Hester Mullins, wife of Dolphie Mullins, of Pine Hill, from pneumonia following influenza. Mrs. Will Doan, of Mt. Vernon, and two children. Mr. Doan has been in a critical condition, but some better at this time. A child of Bev Thomas on the 18th and one on the 19th. Both influenza victims. Willie Payne, age about 19 years, son of W. D. Payne, died of pneumonia following influenza. 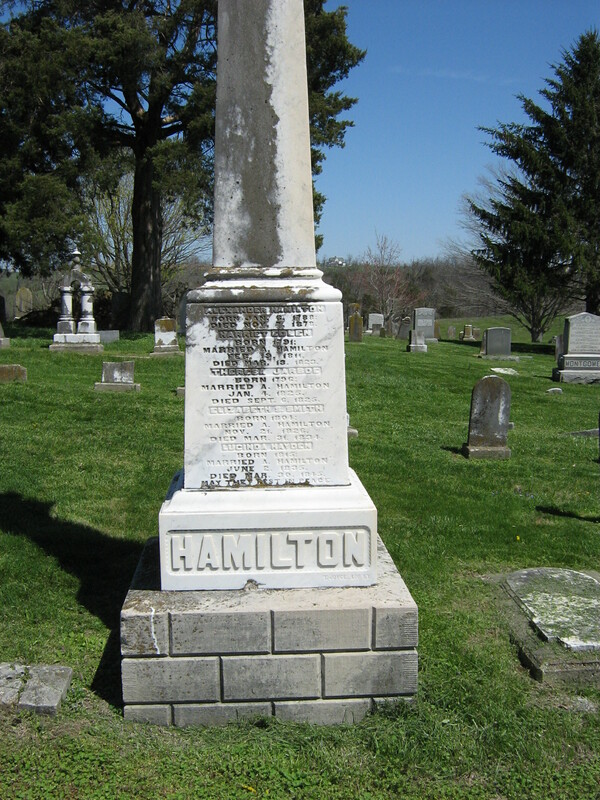 The seven year old daughter of W. G. Clark, of Livingston, died of influenza. Mr. Clark lost another child about a month ago. 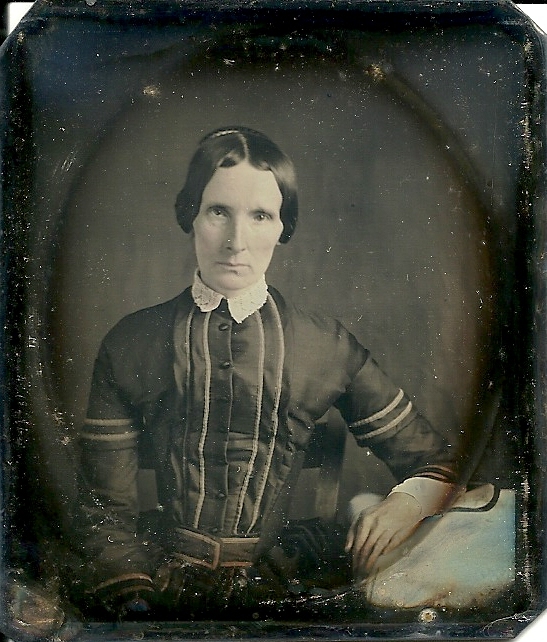 John William Morris’ daughter at Pine Hill, died from influenza. The baby of Mrs. Susie Cummins. Sam Lewis Sowder, age 17, son of Mr. and Mrs. Micajah Sowder, died Monday night of pneumonia following influenza. 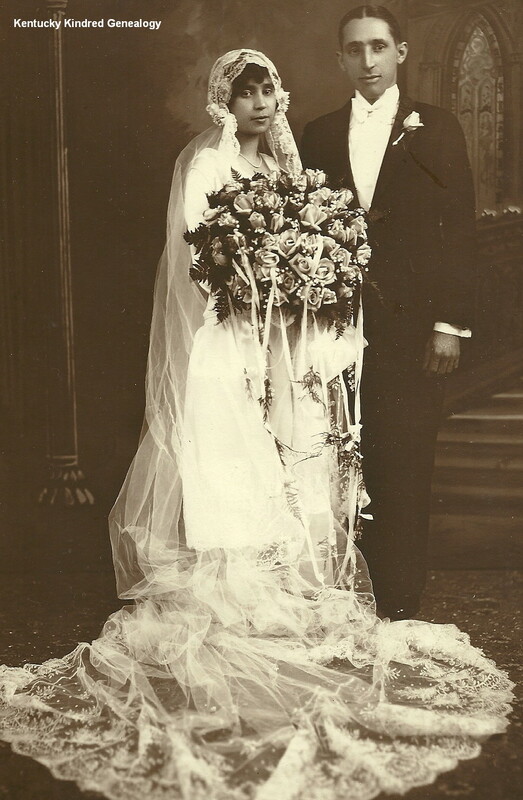 Mrs. William McHargus, who was Miss Mattie Butner before her marriage, died Tuesday of pneumonia, following influenza. A son of Charley Cromer, of the Skeggs Creek section, died of influenza. 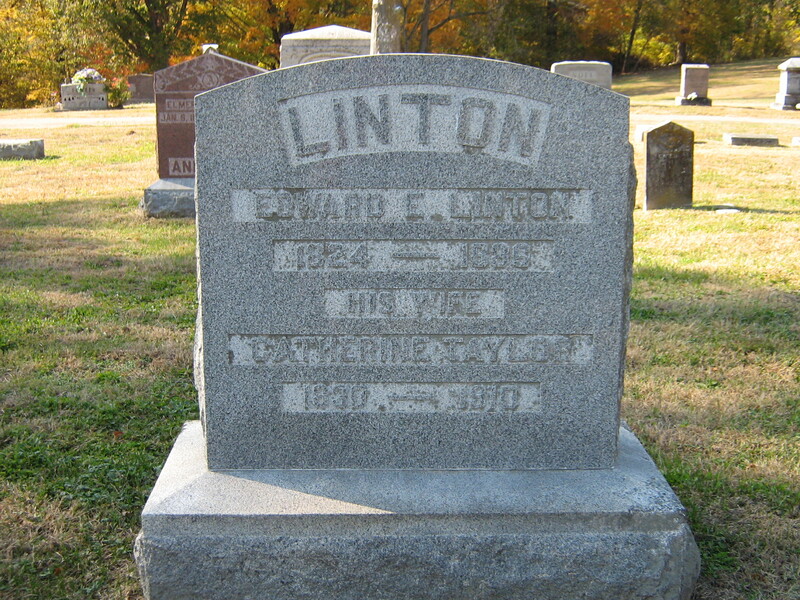 A son of Will Ponder of near Livingston died last Monday and on Friday Mr. Ponder lost his daughter – both victims of flu. Miss Isabelle Tyree, living near the fairgrounds, died of influenza. Mrs. George Hellard died at Livingston from the effects of influenza. Eugene Gentry, son of the late George Gentry, died last night of influenza and heart trouble. A small child of Steve Morris died at Pine Hill last night. The second death occurred in the family of Micajah Sowder last night, when their five year old baby passed away. Mr. and Mrs. Sowder are certainly having more than their share to bare. There are so many more instances of Spanish Influenza and the horrors it inflicted on people world-wide. I wanted to share a few from the state of Kentucky. Until I did a little research I never realized how devastating this epidemic truly was. 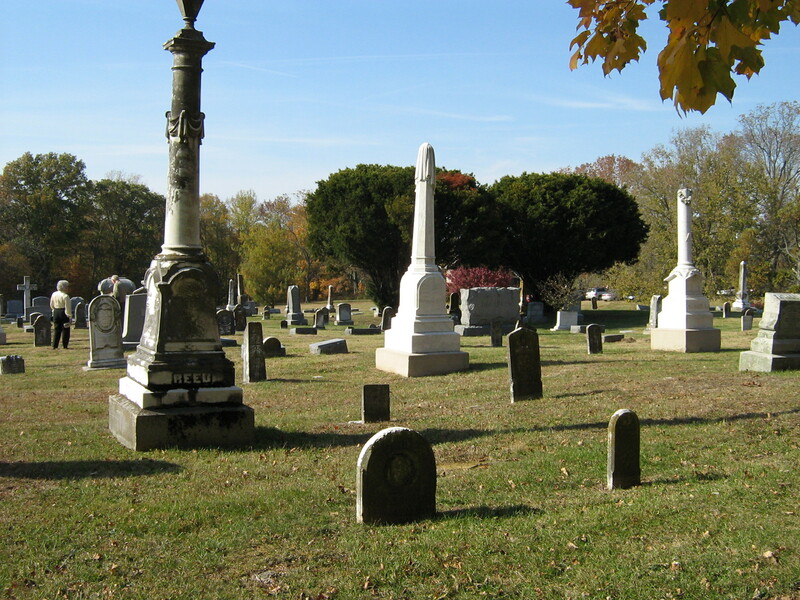 Do you have ancestors who died during this outbreak? As far as I know I don’t have direct ancestors, but there were probably distant cousins or aunts or uncles who lost their lives during this time period. Our lives are shaped not only by the people around us, but the history they live through, and so it continues back through the years. History is not a ‘dry as dust’ reading of dates and people and places far removed. History is what our ancestors lived through, and how it shaped their lives – for good or bad. Eugene Gentry was my grandfather. 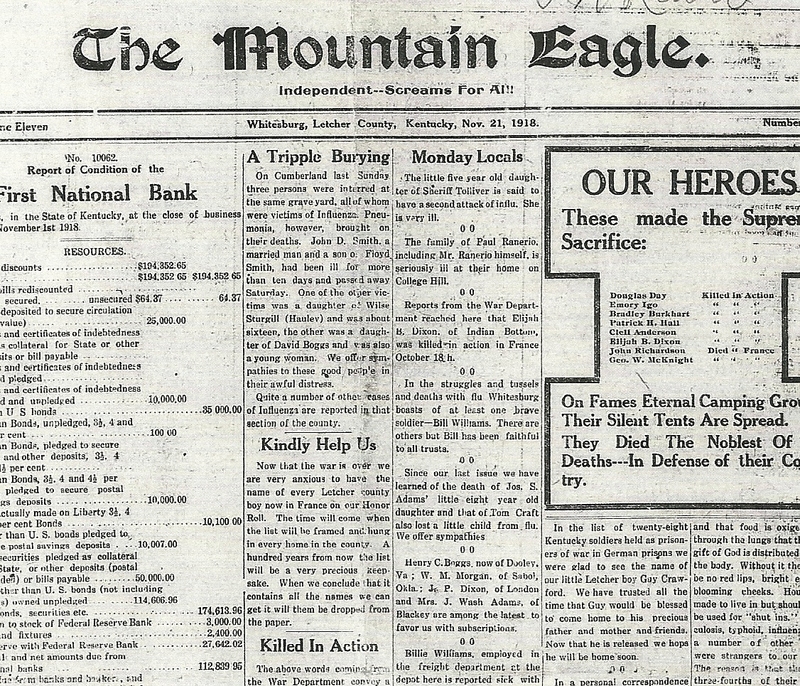 He died of a hemorrhage of the nose related to the 1918 flu outbreak. My father was around 3 when he passed.